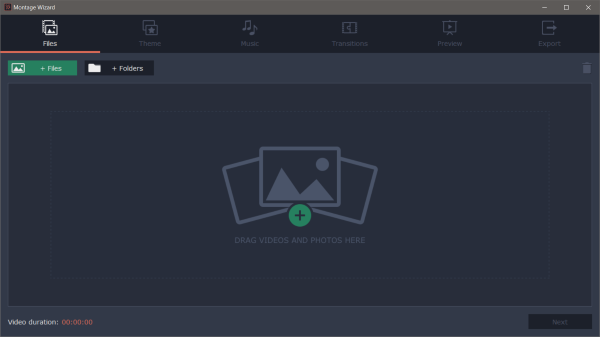 Movavi Video Editor Plus Review: It will cater to all video editing needs! Do you record a lot of videos? Having a good video editing software in your toolbox is a must. These tools let us compile our raw video clips into beautiful short movies. 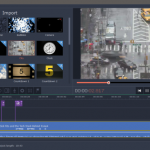 A good video editing software is characterized by its ease of use, availability of effects, features and fast processing while working on large files. The tool that we are going to review checks all these boxes and makes up for a really good video editor. Movavi Video Editor Plus is a premium video editing software for Windows that will cater to all your video editing needs. Let us take a look at its features and the functions that it has to offer. Every video editing project starts my importing your videos into the playground. With Movavi Video Editor Plus, it is a little different. Apart from importing your videos, you can also use the pre-included videos and music. There are plenty of sounds, music, sample videos, backgrounds and intro videos to choose from. These files are not included in the setup but can be downloaded into the project with a simple click. Apart from selecting videos to import, you can directly record content from your device’s camera. Similarly, you can record audio from your device’s microphone. 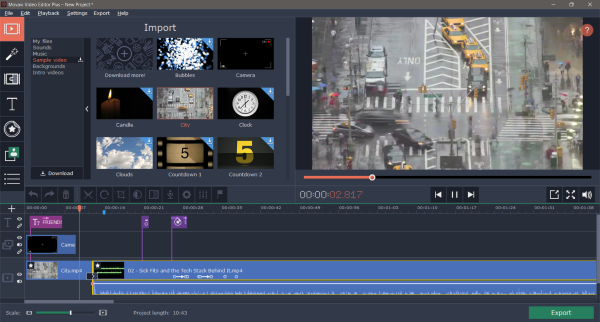 Movavi Video Editor features a full-fledged audio editor that caters to all your audio related requirements. The other most important feature of any video editing tool is its timeline. Movavi Video Editor Plus has improved its timeline across versions, and it is in one of the best shapes. The timeline is easy to navigate; you can easily arrange your videos and audio. The best part about the timeline is that it supports up to 99 tracks. So, you are never going to run out of tracks on your timeline for sure. You can add video tracks, audio tracks or title tracks each serving their own purpose. Whenever you add a new video to the timeline, you can right-click and select Detach if you want to edit video and audio separately on the timeline. The controls just above the timeline let you perform various basic operations with your video clips. Videos can be split, rotated or cropped. You can remove portions of a video by splitting into parts and removing the desired section. Other than that, you can perform color adjustments and add a transition in starting of a clip. 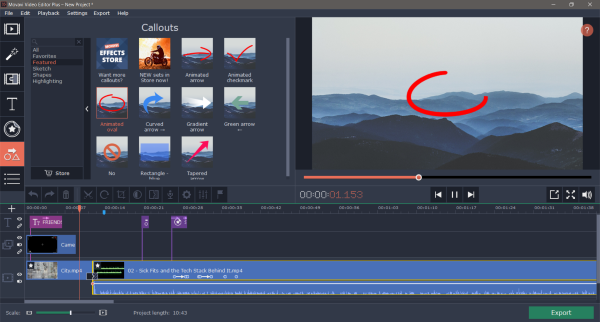 Another good feature offered by the timeline of Movavi Video Editor Plus is Add Marker. You can add markers on your timeline so that it is easy to find a location later. Transitions are a good way to blend in two videos, and the tool offers plenty of them. Transitions are well divided into different categories, and you can also head over to Movavi Effects Store if you want to download more of them. Similarly, there are quite some Titles available. Each one of them animates differently and are a very good way to add some cool headings on top of your video clips. Stickers can be used to add clip arts on top of your video clips. Their duration, position, and timing can be easily controlled from the timeline itself. Callouts are another interesting element in Movavi Video Editor Plus. Callouts are special types of stickers that are particularly used to point out something in the video. You can add arrow callouts, highlighted areas or animated strokes. The tool lets you animate almost anything you’ve added on top of video clips. You can animate callouts, stickers and even titles. Moreover, you can choose one of the presets available or define animations with custom settings. Again, the timeline can be used to adjust their position and duration in the final video. Pan and Zoom are special types of animations that are applied to the entire video. You can zoom into the video for a certain duration and then zoom out after that. You can also select the area you want to zoom in and out from. Shaky videos? No problem as the tool comes with a built-in video stabilizer that can be used to reduce camera shake from recorded videos. The stabilizer takes in arguments such as Accuracy, Shaking, Radius, Smoothing and Edge Cropping. Stabilizing might take a little while if you are performing it on a relatively large video. A very useful part of any video editor, it is used to highlight or blur out some parts of the video clip that you are editing. You can control the size and location of the area that you are working in. Furthermore, opacity and other inputs can others be adjusted easily. Chrome Key is a professional feature that is used for background removal in movies and videos. You must have seen green curtains, and this is the feature that helps people put stunning backgrounds on those green curtains. So, this was pretty much all about features that Movavi Video Editor Plus has to offer. Once you have created your awesome video, you can export it to various formats that are good for publishing or transferring over the internet. Apart from that, you can also save your projects so that you can work on them later. The program also offers a quick video mode that lets you create your perfect video in just five steps. In the first step, you have to import your videos. In the second one, you can choose an overall theme for the video. The third step lets you add some music to it. In the fourth step, you can add some transitions, and in the last step you can preview it and export it. This wizard-like interface makes it really easy to quickly create a proper video from raw clips. Movavi Video Editor Plus is one of the best video editors I have used. It is easy to use and does not require in-depth knowledge of video editing operations. Its intuitive features get the job done, and the tool does pretty well on performance. Download it from movavi.com. 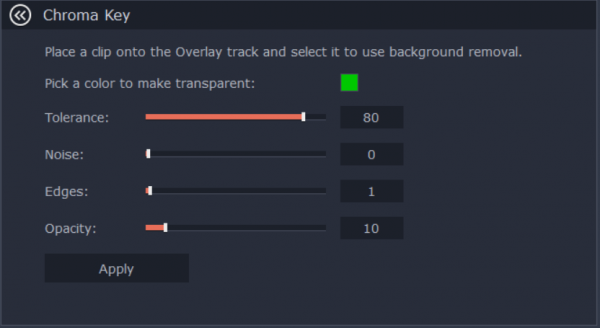 You can use the tool for free but with limited features. A premium copy can cost you around USD 59.95 – but let me assure that it is worth the price!